Card Text Each time you use an artifact, gain 1 . Flavor text Logos are divided into two camps: Theorists and Mechanists. Each believes themselves to be superior to the other. Can I use an artifact’s “Action:” or “Omni:” ability even if it has no valid targets (to trigger Veylan Analyst’s ability)? Yes, as long as you resolve as much of the artifact’s ability as you can. 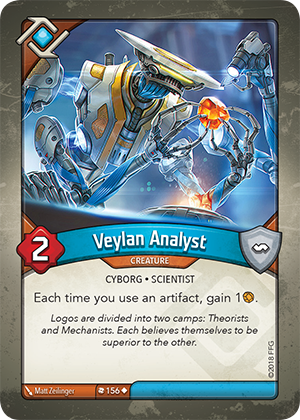 If there are no valid targets for the artifact’s ability, the artifact would become exhausted, the ability would not resolve, and it would be considered used for the purposes of other card abilities that trigger when an artifact is used, thus allowing you to gain 1 Æmber from Veylan Analyst’s ability. For Veylan Analyst’s constant ability, do I gain 1 Æmber before or after resolving the “Action:” or “Omni:” ability on an artifact? Before. Æmber is gained immediately when the artifact is used, but before the “Action:” or “Omni:“ability resolves. This means that if you have 0 Æmber before using the ability on an artifact such as Pocket Universe or Safe Place, you will gain an Æmber first (from Veylan Analyst), then be able to place that Æmber on the artifact.